For Christmas 2011 I was so sick I missed Ev’s work Christmas Party. This was tragic, because they throw pretty bloody awesome parties and we had been looking forward to it for a month. Guess who had to wake up that morning minus a voice and plus a raging headache and sore throat? Not. Cool. 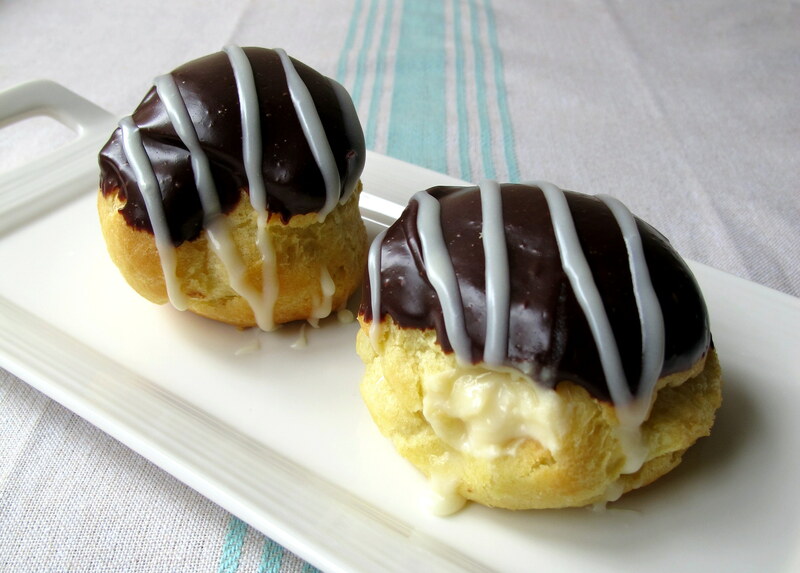 Ev decided that he would try to make me feel better by baking me eclairs… only it turned out that I had to bake them myself. He just produced the recipe; how supportive of him. But he did stand around while I made them… I suppose that counts for something. I’m not sure where he pulled the recipe from but it turned out to be a bit of a dud – luckily, we’ve improved it since then – both to FODMAPify it and to create a recipe that works equally as well for a good cup for cup gluten free blend, spelt and wheat flours (depending what you choose to use). The recipe is separated into three parts; pastry, custard and the chocolate icing. To make the pastry with wheat flour, just use normal plain flour and omit the xanthan gum. Butter is considered low in lactose, as it’s mostly fat and lactose, as a carbohydrate, is water soluble. Eggs contain no FODMAPs but can be an irritant/allergen in their own right. Though, not a FODMAP or gluten issue. Choose a flour that suits you best. If you’d like to use white spelt flour, omit the xanthan gum. Spelt flour is lower in FODMAPs than wheat flour and it’s gluten is more readily digestible, however it is not officially low FODMAP according to Monash – only sourdough spelt is. Wheat flour is not low FODMAP, though you could use it if you have no issues with wheat. Milk and double cream can be found in lactose free varieties if you malabsorb lactose (are lactose intolerant). 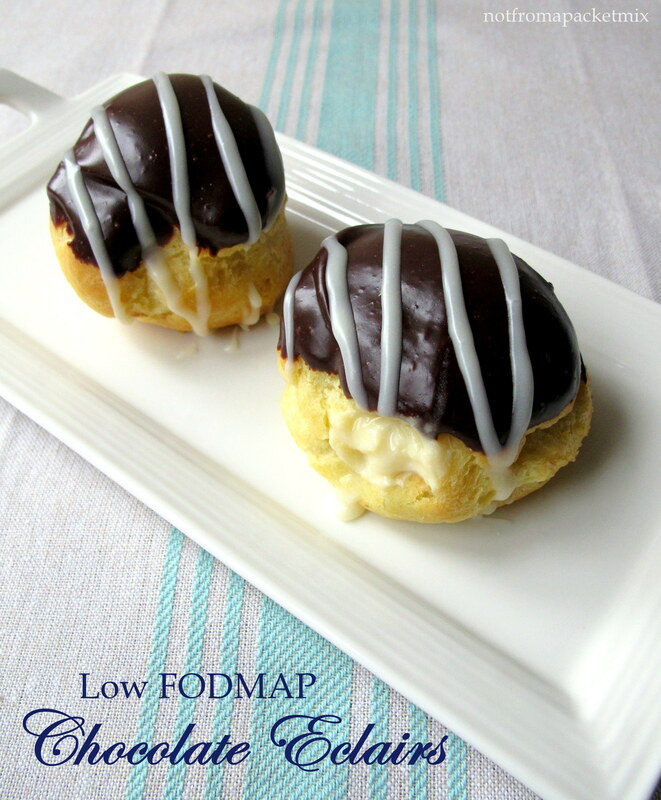 Choose a chocolate that you can tolerate for the icing, dark chocolate is low FODMAP in a single serve (about the amount on top of a single eclair) and can be found in dairy free varieties. Please note that white chocolate isn’t low in lactose, as it contains at least 14% milk solids. 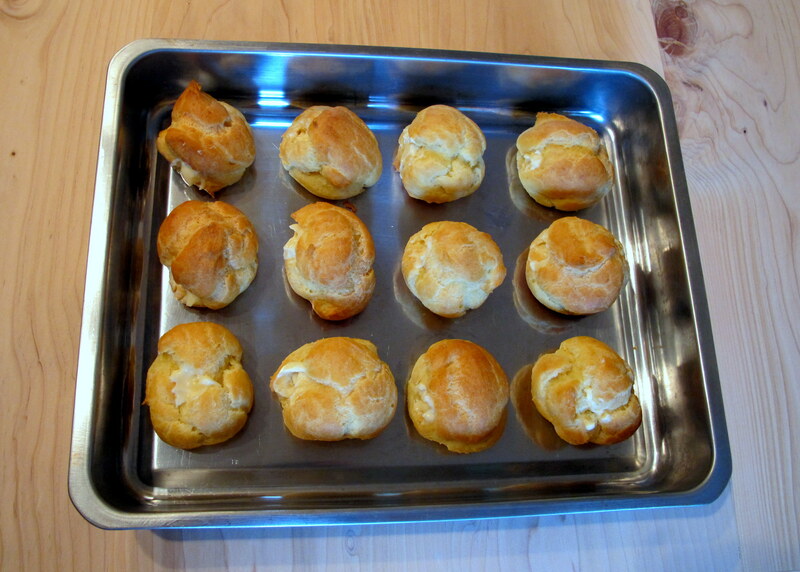 To make the choux pastry (the eclairs), bring the water, butter and salt to the boil. Remove it from the heat and stir in the flour (and xanthan gum if you are using gluten free flour). Beat over a low heat until the mixture leaves the edges of the pan; this won’t take too long. Remove the pot from the heat once more and gradually beat in the eggs until the mixture turns shiny/satiny and breaks into strands – this part will take much longer with gluten free flour than with wheat or spelt flour. 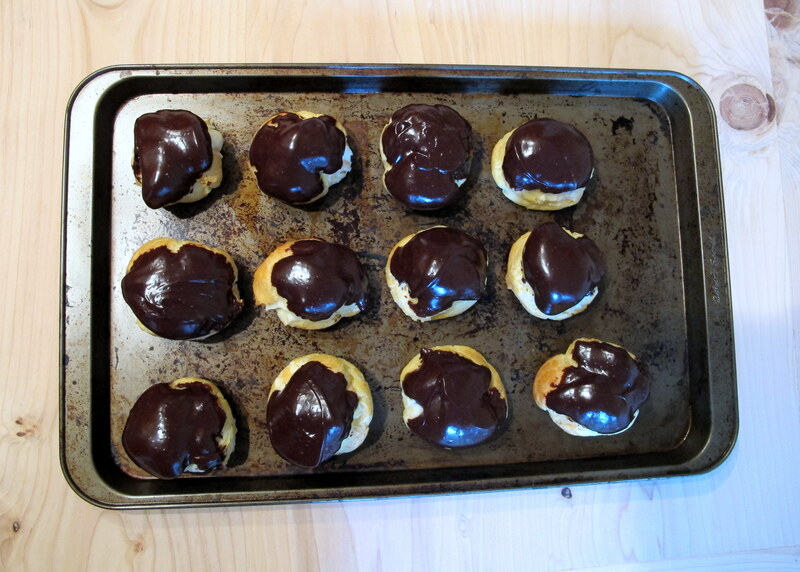 But hey, you’ll earn your eclairs… unless you use a stand mixer. To bake, preheat oven to 400 F and either use a 12 hole muffin pan (my cheat’s method) or put the mixture in a plastic zip lock bag and snip off the corner to pipe out 12 logs (about 4 inches long and 3 inches apart), or circular blobs, on a biscuit pan lined with baking paper. The muffin shapes aren’t as pretty but it’s easier to gauge how much mixture is going into each eclair. 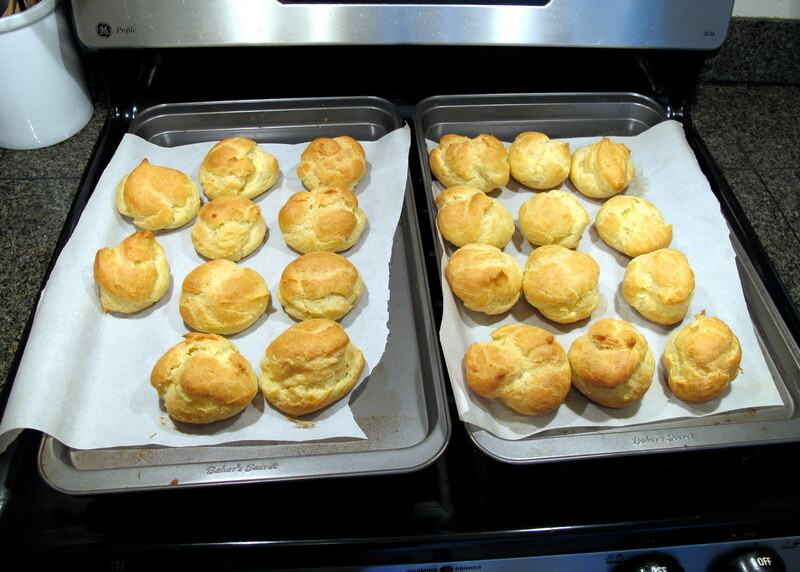 Bake for 35-40 minutes, or until they are a light golden brown and sound hollow when tapped. 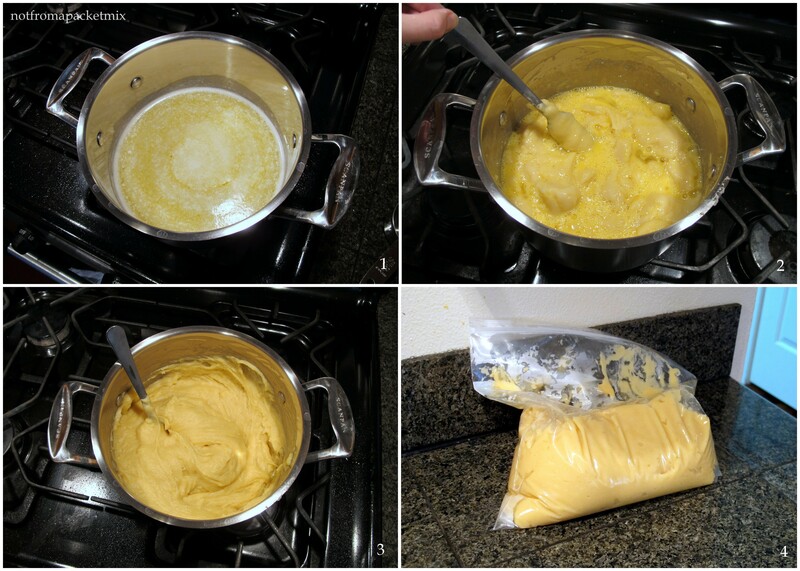 Click here for a more detailed description on how to make the custard. To make the custard, heat milk slowly in a medium saucepan until it is just bubbling at the edges. In a small bowl, combine sugar and corn starch and mix well. Stir into hot milk all at once. Cook, stirring over a medium heat, until it boils. This takes time, don’t be impatient; and keep stirring or you will get lumpy custard. Reduce the heat and simmer for one minute. Beat a small amount of the mixture into the egg yolks and then pour the egg yolks back into the saucepan and cook, stirring, over a medium heat until the mixture boils and thickens. Stir vanilla in at the end. Again, don’t rush the process or your custard will be lumpy. Place a sheet of waxed paper over the surface to prevent a skin from forming on the custard, or simply place the lid on the pan. Refrigerate until ready to fill the éclairs. I like to punch a hole in the side of each eclair with a chop stick and then use a piping bag full of the cooled custard to fill each pastry. Get the chocolate chunks ready in an heat proof mixing bowl. Put the butter and cream into a saucepan and bring it to the boil (it should just start to foam at the edges), before pouring it on top of the chocolate chips and mixing vigorously until the cream has melted the chocolate and a smooth ganache has formed. This can be done by hand or in a stand mixer. 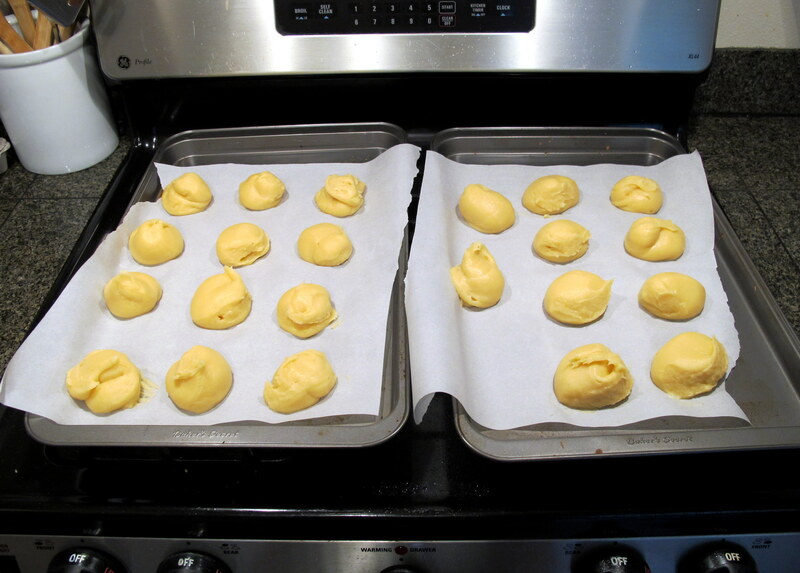 Keep mixing for a few minutes, to let it cool a little, before icing the eclairs. Dunk the top half in the icing and set them back the right way up to let the chocolate set. If you choose to decorate with sprinkles, the ganache needs to be sticky and warm for them to set. If you’d rather use white chocolate ganache, let the dark chocolate ganache set before piping on the white chocolate, otherwise it will slip off. To create white chocolate ganache, use the same proportions of cream to chocolate above but substitute white for dark. Please note that white chocolate isn’t low in lactose, so avoid if you have lactose malabsorption. 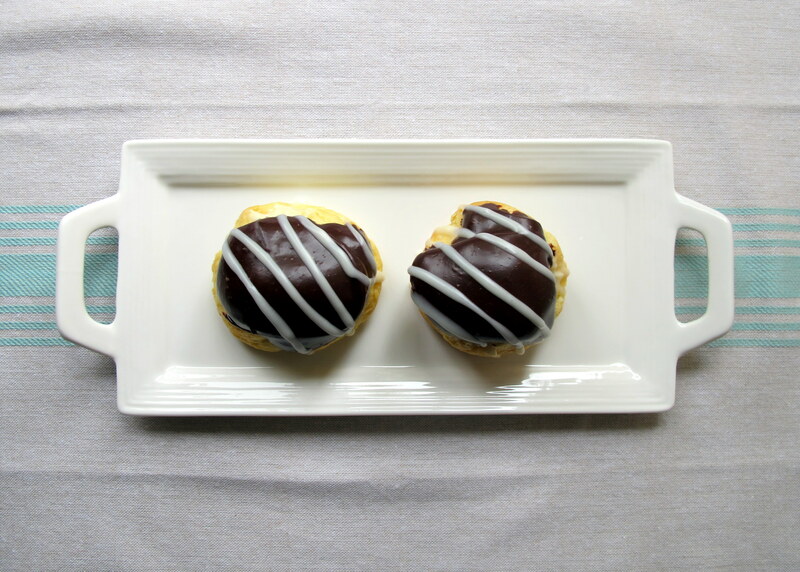 How to spike your eclairs for St Patty’s Day!… or any other occasion. To the custard, add 2-3 tbsp. of Jameson’s Irish Whisky with the vanilla extract at the end. Their website says that it is GF. To the chocolate icing, add 2-3 tbsp. of Irish Cream at the beginning. I am a huge fan of Saint Brendan’s Irish Cream over Bailey’s. It’s cheaper (at least here in the USA) and is actually made with cream. Their website FAQ section says that it is GF. Sprinkle with green crystals or perhaps draw a clover leaf? It’s all up to you! This entry was posted in Cakes, chocolates & custard, cupcakes & scones, Mousse, pies & tarts, Sweet pastries, Sweets and Desserts and tagged Baileys, chocolate, custard, dessert, french, fructose friendly, fructose malabsorption, gluten free, green, Irish cream, pastry, spike, Sprinkles, St Patrick's Day, vanilla, vanilla bean, whiskey. Bookmark the permalink. I’m going to make these! Thank you so much for all the work you put into these! The pictures make me brave enough to give it a shot! Cannot wait!